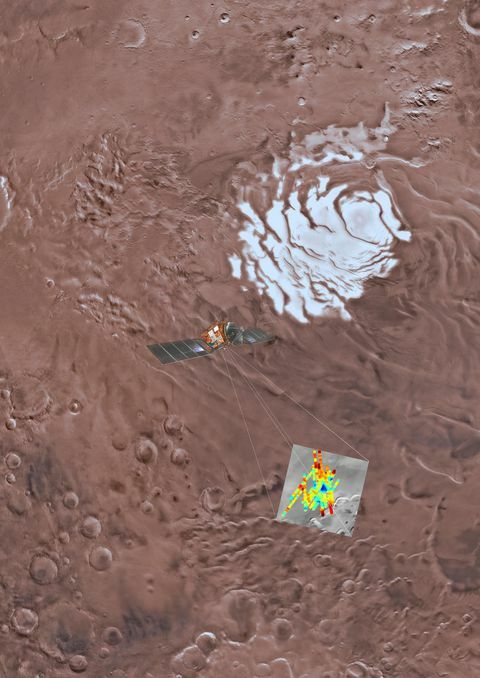 The implications for complex systems of subsurface lakes could revitalize the debate about whether microorganisms could exist beneath the surface of Mars to this very day. “It was a long march, a sort of long march through the desert, and we are finally out of it,” Orosei says. “It’s like a dark cloud has gone away.” …. For the moment, let’s assume they discover life on Mars. Now let’s get theological and biblical. When God spoke this universe into existence about 13.7 billion years ago (the current scientific dating of its age), the word of his power was so strong and effective that it embedded within the material stuff of his creation the building blocks for life. He did not need to “zap” it countless times, as his creation progressed and even progresses right now. Zap! Zap! Zap! No. His power fully gifted his creation only once “in the beginning,” says Genesis 1:1. At that moment, life could slowly emerge from chemicals and non-organic material and evolve by secondary causes into higher life forms. Call it slow-motion creation. It should not bother us believers to find out that Mars (and elsewhere) may contain evidence for microorganisms or the chemical building blocks for life. Just the opposite. It should bother us if we found out those things do not exist in those places! If God fully gifted his creation so effectively, then why didn’t life evolve further on Mars? Simple. The conditions were not right. God spoke the universe into existence, and now it is moving forward through secondary causes and effects. If they don’t have or produce the right conditions, then life cannot evolve far enough. It stops. This makes his creation on earth all the more amazing. We’re here discussing science and theology with our brain power, all his gracious gifting! Now let’s wrap this up. God is the Primary Cause, and his creation operates through natural laws or secondary causes and effects that he set up. It is a top down creation. I for one celebrate any new discoveries that reveal God’s creative, life-giving power and design. This entry was posted in Bible and Theology, Short Hot Topics and tagged Bible and science, life on Mars, New discoveries on Mars by james malcolm. Bookmark the permalink.